The daily diet between rich and poor varied considerably — the poor would have had a monotonous lack of variety in their daily food with little beyond course bread and bean or pea broth, with only the occasional addition of meat. For the rich, life in a villa in Roman Britain, would have been secure and pleasant for the wealthy owner and his family. Home-ground flour and freshly-made bread, home grown vegetables, a well-stocked orchard of apples, pear, cherry and plum trees; specially reared pigs, sheep and oxen, together with an abundance of wild fish and game, would have assured the inhabitants a variety of good food. Romans liked mixing sweet and savoury foods so honey was used widely in a range of recipes. For example, when preparing vegetables a mixture of honey, vinegar, salt and water was used (called oxymel). Honey was the main source of sweetening, a preservative for meat and fruit and a common ingredient in many dishes and sauces. Beekeeping was, therefore, an important industry, most farms employing one man known as the apiarus to look after the hives. 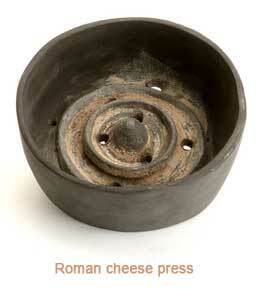 The Romans ate cheese a great deal. Roman soldiers had cheese as part of their rations. Cheeses were abundant and varied and, much enjoyed — smoked cheese was a particular favourite, many foreign varieties being imported by the Romans. 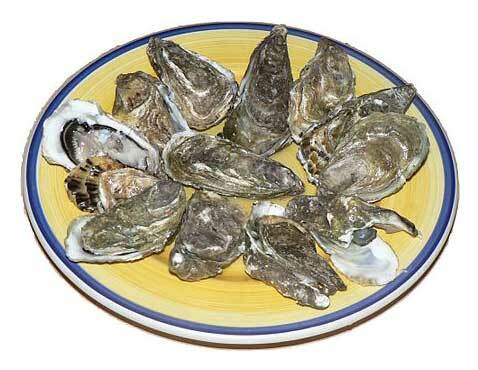 It was eaten freshly made or preserved, and formed an important ingredient of bread and fancy cakes. Most Roman cheeses were fresh cheeses, though the Romans fully understood the use of rennet to make hard-cheeses, and did so. There was a substantial trade within the Roman Empire in cheeses — this would have been hard cheeses though, as there was no refrigerated transport for fresh cheeses, which would have been produced and consumed locally. In the first century AD, one street in the west side of the Palatine in Rome was famous for the cheese sellers in the street, who sold smoked cheeses. "The kinds of cheese that are most esteemed at Rome, where the various good things of all nations are to be judged of by comparison, are those which come from the provinces of Nemausus, (modern day Nîmes) and more especially the villages there of Lesura and Gabalis; but its excellence is only very short-lived, and it must be eaten while it is fresh. The pastures of the Alps recommend themselves by two sorts of cheese; the Dalmatic Alps send us the Docleatian cheese, and the Centronian Alps the Vatusican. The kinds produced in the Apennines are more numerous; from Liguria we have the cheese of Ceba, which is mostly made from the milk of sheep; from Umbria we have that of Æsina, and from the frontiers of Etruria and Liguria those of Luna, remarkable for their vast size, a single cheese weighing as much as a thousand pounds. Nearer the City (meaning Rome), again, we have the cheese of Vestinum, the best of this kind being that which comes from the territory of Ceditium. 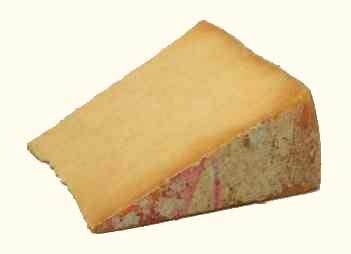 Goats also produce a cheese which has been of late held in the highest esteem, its flavour being heightened by smoking it. The cheese of this kind which is made at Rome is considered preferable to any other; for that which is made in Gaul has a strong taste, like that of medicine. Of the cheeses that are made beyond sea, that of Bithynia is usually considered the first in quality. That salt exists in pasture-lands is pretty evident, from the fact that all cheese as it grows old contracts a saltish flavour, even where it does not appear to any great extent; [Ed: Pliny is speaking of Bithynian pasture-lands and cheese] while at the same time it is equally well known that cheese soaked in a mixture of thyme and vinegar will regain its original fresh flavour." 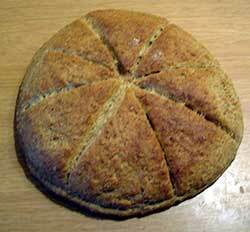 If bread was baked at home, the flour was first ground by hand on a rotary quernstone. Pies and pastries would be put in the oven after the main bread baking was over. Several kinds of flour were used, the fine white variety being considered the best, while dark bread was given to the unimportant visitor. This is one of the differences between ancient cooking and modern: they valued fine white bread, while today, it's the breads with the natural grains that are sought after and popular. Before the Romans arrived in Britain in 43AD, Britons in general had regarded shellfish as something of a subsistence food, handy to have in times of need but never to be sought after when there was fish or meat to be had. However, the Romans brought with them an enthusiasm for eating sea animals of all kinds, and once the military invasion was over and traders and civilians began to arrive, a demand quickly built up for all kinds of fish and shellfish. 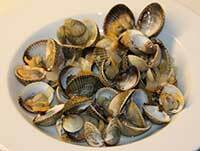 The shells of oysters, whelks, cockles, mussels and limpets are found extensively on the sites of Roman villas, towns and forts at least as far north as Hadrian's Wall, not only near the coast but also at great distances from the sea, presumably transported alive in water tanks. Oysters, cockles and mussels would be brought from the coast in barrels of brine to be sold inland. Salt was an important commodity, obtained from the many salt pans round the shores of Britain. For those who could afford it, ientaculum or breakfast, was eaten very early and would consist of salted bread, milk or wine, and perhaps dried fruit, eggs or cheese. It was not always eaten. Upper class Romans had a slightly different breakfast. They might have some type of meat or fish, and fresh fruit or vegetables to go with their bread. They did not have sugar so they used honey to sweeten their food. There was always a wet towel to wash with after any meal, including breakfast. Lunch or prandium consisted of items left over from the main meal from the day before and occasionally included fish and fresh fruit. The usual time for their lunch was late morning / early afternoon. The main drink of the Romans was wine and it was drunk well-mixed with water in the "Roman way" for daily consumption — the Romans and Greeks watered their wine, not because it was any more alcoholic than modern wine but because it was not right for a sensible citizen to be seen drunk. When it came to wine, there were many varieties of red and white wines. 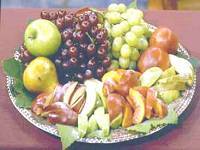 Romans also drank a type of wine called mulsum which was a very popular and was prepared by adding honey to the regular wine. Maintaining vineyards was a common practice in ancient Rome and these vineyards produced some of the best quality wines like Setian and Massic. Calda was drank during the winter — this is wine mixed with warm water and laced with spices. 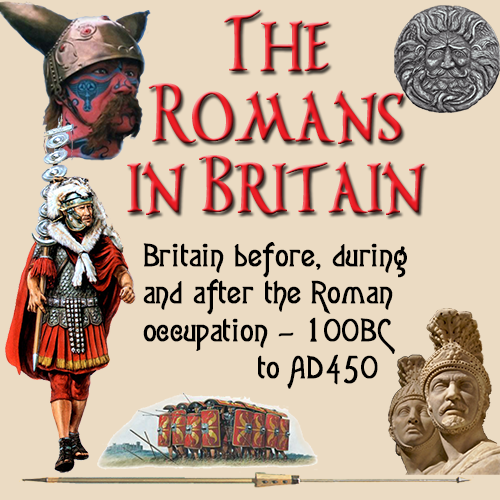 Romans rarely drank the native Briton's beer because it was considered a barbarian's drink by the sophisticated Roman, although after a time of occupying Britannia, the Roman soldiers began to also partake of the native beer. 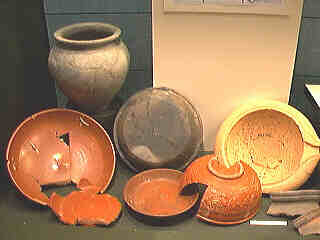 Roman drinks such as posca were as popular as any other food items in a Roman’s diet. Posca was a drink consumed by farmers as well as the soldiers of Roman army. The posca was prepared by adding water to a little quantity of wine and then mixing it with various spices for enhancing the taste. Since, the army received vinegar in large quantities as part of their rations, soldiers used it rampantly to make posca. By adding water to the vinegar, they made the drink consumable. Water in ancient Rome was mostly contaminated, but when added with vinegar was perceived as a healthy drink. Romans rarely drank milk and, if they did consume it, that milk was almost always goat's milk, not the cow's milk that we drink today. The main meal at the end of the day was regarded as an important occasion. The family gathered together, often with friends, after a visit to the public baths or their own private bath suite and sat or reclined in the triclinium, a pleasantly decorated room usually with a fine mosaic floor. This was the room where the Roman host would entertain his guests and seek to display his wealth and status. Dinner usually consisted of three courses, accompanied by wine imported from Italy, France or Spain, viticulture being unknown in Britain until the second half of Roman occupation. These large banquets would entail a great deal of preparation and one can imagine the scene of frenzied activity in the kitchen beforehand, as cooks and slaves busied themselves under the supervision of the lady of the house. Pots and pans simmered and bubbled over burning charcoal on the stove, ingredients for sauces were pounded and mixed in mortaria. Through all of this, the cooks made good use of the wine and oil stored in their amphorae, together with herbs and costly spices; all to ensure that the guests would be suitably impressed with their meal — and that was the point of it: to impress the guests. A Roman dinner usually consisted of three courses, accompanied by wine imported from Italy, France or Spain, viticulture being unknown in Britain until the second half of the Roman occupation. The Roman dinner party ideally comprised nine guests, in honuour of the nine muses, goddesses of the arts and sciences. Arranged around three sides of a square, the fourth side being left open for serving, the guests would recline on large couches, each accommodating three people. Propping themselves on their left forearms, they would use their right hands for stretching for food and drink. Garlands of rose petals were worn on their heads to ward off the effects of too much wine. Sometimes the guests would pluck rose petals from their garlands and drop them into their wine goblets. With forks being not in common usage and knives and spoons only occasionally used, most people ate with their fingers — a messy arrangement when sticky sauces were part of the meal. Napkins were provided to protect the couches. Guests would also bring their own napkins, and according to contemporary satirists, sometimes stole their neighbours' napkins. After a suitable offering by the host to the household gods (together called Lares), the meal would commence. Food would be served on bronze, pewter or the popular decorated red terra sigillata (also called: Samian-ware) dishes and wine would be drunk from small cups of glass, terra sigillata or pewter. 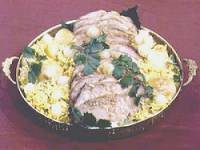 The meal began with gustatio or hors d'oevre, often an egg dish, vegetables raw and cooked, including asparagus, peas, beans, carrots, lettuce, endive, radishes, and cucumber. Gustatio could also consist of salt fish, oysters, mussels or the specially fattened dormice, cooked in a variety of ways. During the meal mulsum — a mixture of chilled white wine and honey — or course wine mixed with water, would be drunk, the more expensive wines, such as Bordeaux, being reserved for serious drinking after the meal. Entertainment such as music on the lyre or cithera, or perhaps poetry reading would be provided during and after the meal. "When they season their dinners they don't use condiments for seasoning, but screech owls, which eat out the intestines of the guests alive." "No one at table will know what he is eating." These sauces were usually thickened with wheat flour or crumbled pastry. 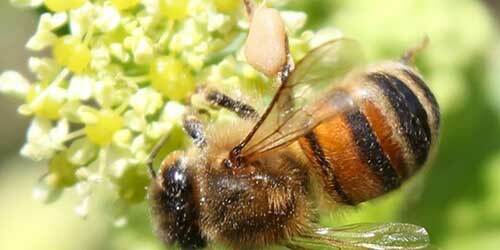 Honey was often incorporated into a "sweet-sour" dish or sauce. Favourite foods of the Roman gourmet included snails fattened on milk until they could no longer retreat into their shells; dormice fattened on nuts in special earthenware jars — "battery dormice"; pigeons immobilized by having their wings clipped or legs broken, then fattened; oysters in plenty and other shellfish; ham and suckling pig; peacocks, pheasant and goose; and chicken cooked in a variety of ways, one of which required the bird to be drowned in red wine. Several dishes would be placed on the table for each person to help himself. Servants kept the guests supplied with small hot rolls (a useful means of cleaning the plate of a tasty sauce and a method still practiced by the French today) and made sure that their glasses were replenished with wine. 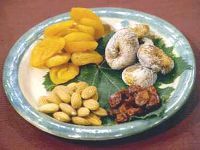 Desserts or mensae secundae, though not considered an important course, would consist of sweetmeats, pastries, dried or fresh fruit and nuts. After the remains of the meal had been cleared away, the guests continued to recline and toast each other with wine, the entertainment continuing in as elaborate a form as the host could afford. Important banquets would often end with clowns or jugglers performing or even gladiator fights. 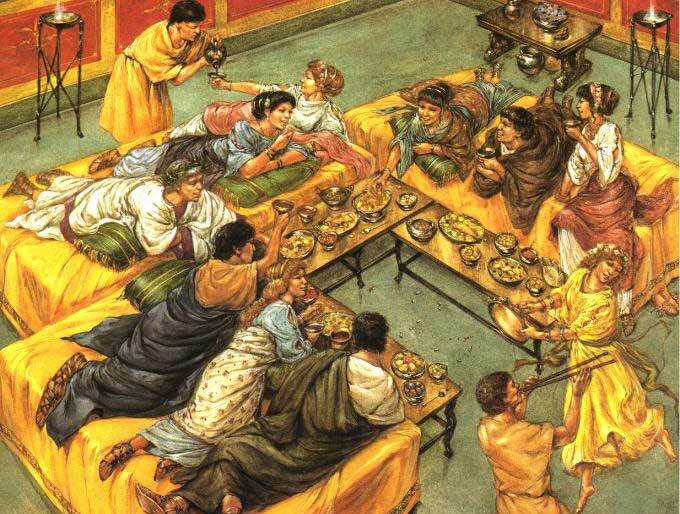 Formal banquets would be given to celebrate special occasions in all parts of the Roman Empire. Distinguished and wealthy hosts would go to enormous lengths to surprise and delight their guests. In his golden palace Emperor Nero had constructed a spectacular dining room in which there was a revolving ceiling which turned day and night, in time with the sky. Other dining rooms had ceilings of fretted ivory, the panels of which could slide back and let hundreds of flowers or perfume from hidden sprinklers, shower upon the guests. Often grains of gold, pearls, and amber and other precious jewels would be hidden among various dishes and their contents. No doubt some pockets would have been bulging by the end of the meal! At these elaborate feasts it was customary to have a particularly important delicacy, such as a sturgeon, borne into the room accompanied by a procession of slaves playing flutes, while others danced in time to the music. "A hare tricked out with wings to look like a Pegasus, a wild sow with its belly full of live thrushes, quinces stuck with thorns to look like sea urchins, and roast pork carved into models of fish, song birds and a goose." "collected in every corner of the Empire from the Parthian frontier to the Straits of Gibraltar." Not everyone cooked at home. Town dwellers would have handy access to the local bakers, pastry cooks and cooked meat shops, as the stone reliefs and excavations of Pompeii illustrate. Poor Romans ate bread, vegetable soup, and porridge. Meat was a luxury, unless they lived in the countryside and could go hunting or fishing. Poor people's small homes had no kitchens. So they often took their foodstuffs round to the baker, to cook in his oven. Most people in the Roman Empire lived mainly on the usual foods of people living around the Mediterranean Sea — barley, wheat, and millet, olive oil, and wine, which we call the "Mediterranean Triad." In addition to being full of carbohydrates, these foods provided fat (the olive oil) and protein (the barley and millet). Poor people ate more millet, and rich people ate more wheat. Starting around 100 AD, poor people started to eat oats, too. If you were poor, you would also eat vegetables like lentils and cucumbers, onions, garlic, and lettuce, fruit like apples and figs, nuts, and sometimes cheese and eggs. Some of those who lived in town apartments would have been without proper cooking facilities. 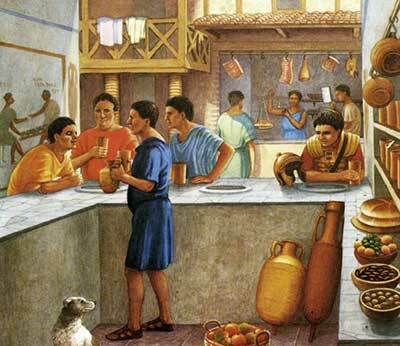 Instead of cooking for themselves they would have eaten, the ancient equivalent of "fast food," at Roman taverns (cauponae) and snack bars. A taberna was a street-side snack bar and featured a thermopolium, a "tavola calda" (hot table) that might be available from the sidewalk. Some times a taberna was simply called a thermopolium. A caupona was predominantly a drinking establishmen, but food was available.